So, another set of pictures from some days ago. I had just picked up a new pair of Incotex chinos from my tailor (thanks to a fellow blogger for the good deal). The color is something that I would perhaps call olive or army, and a pretty faded one at that. The jacket is navy and from a cotton wool blend fabric, perfect for the weather we're having this time of the year. The shirt is a grey gingham check spread collar shirt and the tie an olive green silk tie with white pin dots. Opted for a white cotton pocket square to keep things simple, already enough going on with the shirt's check pattern. Shoes are my Aldens, which I think still went fine with the dry weather. 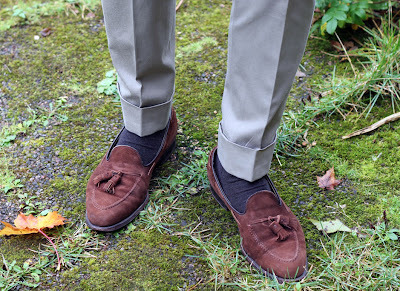 Love how the suede in them and the belt works here with other fabrics and colors. Socks are dark brown merino wool socks. I notice you never wear a watch. Is this for photos only or do you prefer no watch with formal and casual outfits? Yeah, I was going to ask you about the watch too... This outfit is again splendid. 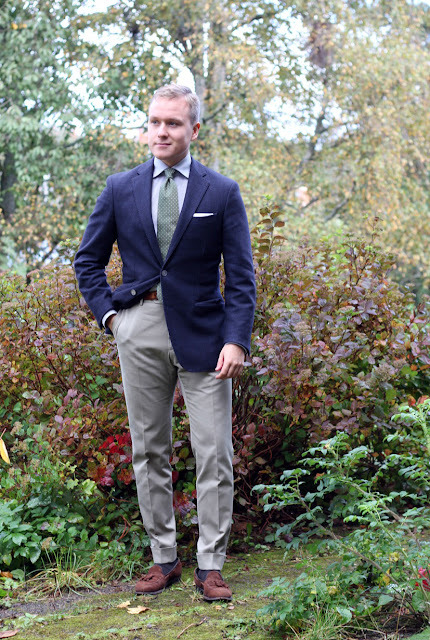 Incotex makes the nicest chinos for the money, don't they? Their slimmest line fit me like a charm. This is my first pair of Incotex chinos, but for now they have been great. These were quite big from the waist and lower legs, but almost too small from my thighs. However after the "operation" I think they ended up very well. Anyway, thanks. I like this one a lot myself as well. Hmm, where do you recommend buying Incotex chinos? Hmm, I've seen some at eBay for good prices every now and then, but that's hardly a steady supply. Some places that seem to have pairs for reasonable prices include Mr. Porter, Threedifferent (I once ordered a pair that never arrived, got a refund though), Yoox and Kafka. 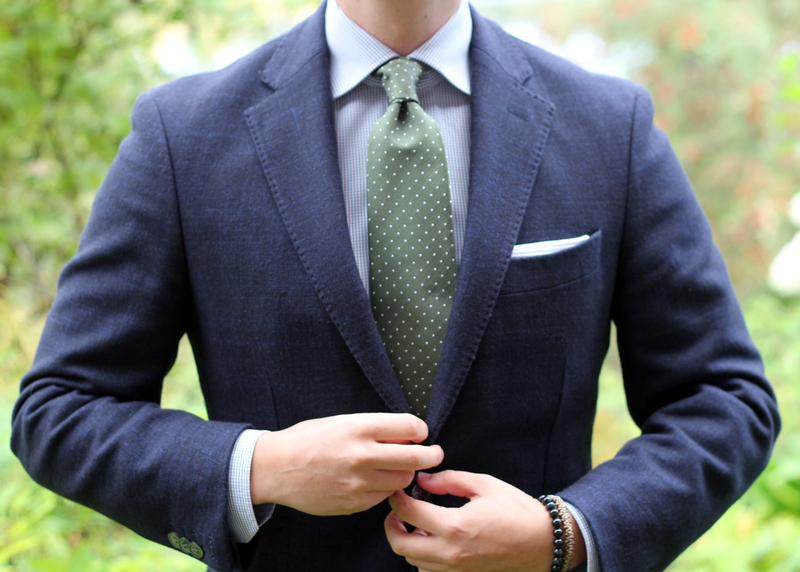 The look is nice, smart yet very stylish. Keep up the good work. I will copycat your style a bit if you dont mind? !